This is one of my most precious possessions, my grandma Braton’s button jar. I have happy memories of playing with the buttons when I was a kid while she was sewing. I never use them, I still bring the buttons out to look at them when I especially miss my grandma. Do you have a button jar? ← Baxter’s Hollow – There’s Gold in Them Thar Hills! plastic…when they were smaller…sorting and counting..Some things never change the world Over! That’s a great idea!! I think I have enough buttons to fill a pint sized jar, and I just might do that some day. 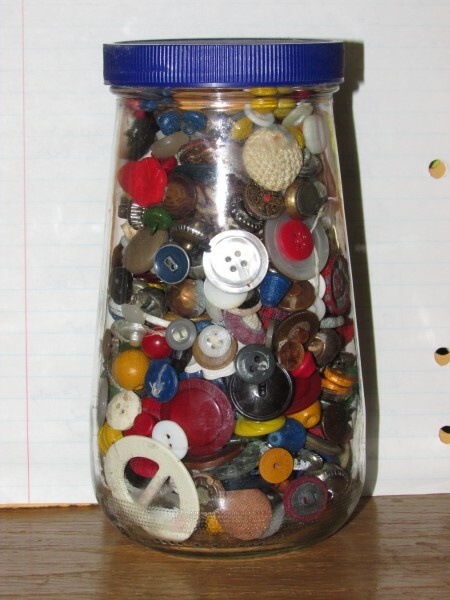 Oh yes, I remeber my grandmother and mother had button jars. I have a -very- small one of my own.